Discussion: Trampas comments on Cory Doctorow's experiment, adding his opinions on how that marketing experiment's already been done... with 7th Son and the massive marketing and promotional efforts that JC put into it after he initially couldn't get it into print the first time around. It's time for authors to start handling the business of book promotions and marketing themselves again, no matter how big or small their publisher may be, because ultimately, the author has just as much, if not more, invested in the long tail success of the work. 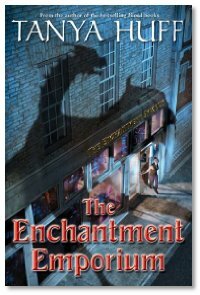 Listener Review: Web Genii brings us a review The Enchantment Emporium by Tanya Huff. Interview: Bringing you Part 2 of the big interview with J. C. Hutchins! J.C. discusses with Mike and Mike the discoveries he's encountered during the process of bringing 7th Son to print, and the differences in attitudes and perceptions between the traditional and the independent media, and what both sides should be able to learn from each other to make things better for everyone.